This story begins in Ohio and crosses an ocean, twice. Forty years ago, Alex Selvig was a young boy playing soccer in Rome, where his father, an ex-pat, was working for the American embassy. He and his younger brother, Fabio, spoke Italian more than they spoke English. Their’s was a childhood that would position them perfectly to become the exclusive representatives for Filippi, the Italian boat builders who produce the iconic white rowing shells with the blue stripe that are often the first boats across the finish line. Selvig has a rower’s build. After growing up in Italy, he was a walk-on at Boston University and immediately fell in love with rowing. After graduation, he continued to row, training and racing at the elite level. Selvig’s rowing career took him to the national team which, in turn, took him to competitions around the world. “My teammates knew I spoke Italian,” he told me, as the heat of the summer surrounded us in Ohio, “so they’d asked me to arrange for a Filippi boat for them at the European regattas.” Filippi boats were getting noticed on the international racing scene, as they began to challenge the German boats that had dominated the podium spots for so long. Selvig would call Lido Filippi, the boat builder who had struck out on his own to start building racing shells in Donoratico in the early 1970s, and use the language skills he had learned in his youth to make the arrangements. When Selvig was ready to stop rowing full-time, he knew he wanted to stay involved in the sport. Working directly with Lido Filippi, Selvig convinced him that he would represent the Italian company well in the United States. Selvig knew he would need to replicate the dedication Lido had established as the Filippi way at regattas: total commitment to supporting the rowers in the white Filippi boats, even if it meant sweltering heat and long days. Selvig knew American rowers would see the quality built into each shell and would row them to the finish lines they were so comfortable crossing first. In 1991, Elite Rowing was born and Alex Selvig became the exclusive representative of Filippi in the U.S.
“We’ll get you into the factory.” Alex’s voice brought me back to the Ohio summer. Fabio, Alex’s younger brother who had recently quit his job with a major cycling company to join his brother’s business, chimed in, “David speaks English. You’ll love Donoratico.” David Filippi is the only son of Lido, and has, after more than twenty-five years of working in the family boat building business, taken over the operations. As it turns out, when I met David Filippi, on a rainy morning in the small town of Donoratico, Italy, several months later, he reminded me of the Selvig brothers. 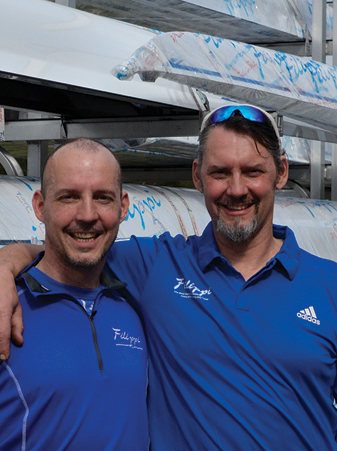 All three of these men–Alex and Fabio Selvig and David Filippi–seem destined to be involved wth Filippi boats. Alex and Fabio’s childhood in Italy and subsequent berth in rowing, David watching his father, Lido, design and build not only elegant and fast rowing shells but the business itself… each of these men seemed to be following a calling that was established for them well before they met. David Filippi grew up as the only son of a boat builder who was known for his ability to craft wood into speed. Indeed, Lido Filippi emerged as a prominent boat designer and builder in the 1960s and ‘70s, after apprenticing for years at the Donoratico shipyard in the town near his home. As the market shifted, however, the Donoratico shipyard struggled to innovate enough to keep pace with the emerging demands, and it eventually folded. In 1975, Lido and his wife, Agnese, took a risk on their future and sunk all of their savings into a ramshackle barn on a fallow field at the edge of town. 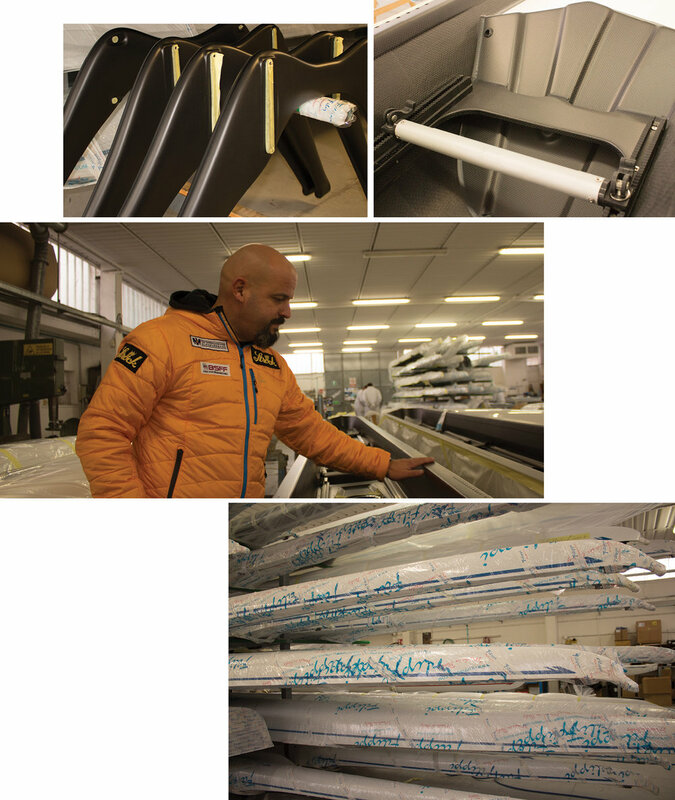 After making that first Filippi shell, Lido drove it to a regatta on Lake Garda, in northern Italy, and the champion sculler Alfredo Bollati tested it. Word of the results–stable and fast–travelled quickly around Europe; orders started to arrive at the factory. As we sat in the lobby of the factory, in Donoratico, waiting for David to finish the call he was on, I picked up a picture book from the coffee table; it was titled Lido Fillipi: A Winning Passion. I flipped it open and happened to see a picture of that first shell Lido had built. The stern of the shell rests on a stretcher and seven-year-old David is holding its bow. The picture was taken in the fallow field behind his father’s barn-turned-shipyard. Now, almost forty years later, we were sitting on that very spot, on a black leather sofa, in the lobby of a temperature-controlled factory that produces 1200 boats each year. David put his iPhone in his pocket as he came out of his office. “Let’s get some lunch first,” he said in perfect English. “Of course,” I thought. I was learning that, in Italy, hurry is not a virtue. Efficiency, yes, but not hurry. Two hours later, after pesca pasta (the sea was a kilometer from the restaurant), a glass of round red wine and San Pellegrino, we would tour the Filippi factory. Over lunch, David spoke softly, leaning back in his chair as he explained the path his life had taken. “After my military [service], I went into the business.” He spent years painting boats, working with his hands in the production bays. He recounts how his father started with only his designs and his hands. “If you want to know–to teach–you have to know the work,” he says. Memories spill out over the meal: the large table in their home with designs hanging over the edge, vacations spent at regattas servicing boats, a childhood with the constant companion of the shipyard. He chuckles, “Other families went skiing, we went to regattas.” The waiter clears our plates. David looks at us, eyebrows raised. “Espresso?” With the nod of his head, espresso and profiterole are ordered. There’s a grace to the Italian air. Something about how the old wood floor creaks under our chairs, or how the sea air swirls through the door when it opens. Or maybe it’s the simple ease David carries with him: a man who is now running the company that makes some of the most sought-after boats in rowing. “1200 boats a year is the right place for us to be,” he says. What this means for a rower who wants a Filippi boat is a three-month wait during the winter and a six-month wait during the rowing season. As we talk, David gently corrects my pronunciation of his family name. “Fi-LEE-PEE,” he says, slowly, wanting me to speak even just a little bit like an Italian. In the distance, as we drive from the restaurant back to his factory, he points out Castegneto Carducci, the small village that is perched atop the nearby hills where his father grew up, before the war. After working in the production and painting bays, David spent fifteen years running the office and doing marketing. 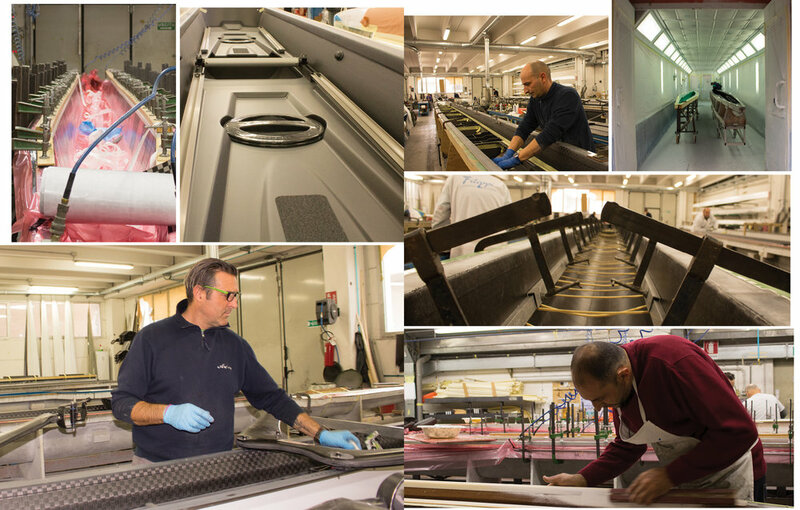 When his father was ready to shift into mild retirement, David was ready to take over the business fully, working with the 30-plus representatives Filippi has worldwide, engaging with his engineers to improve hull design and carbon fiber material usage. 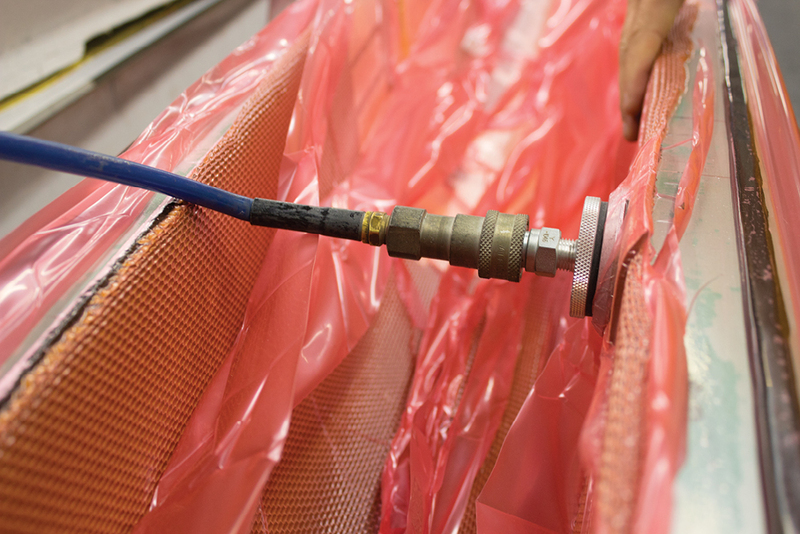 He maintains partnerships with local universities to ensure Filippi has access to materials that are always better and stronger than the ones they’ve used before. The newest hull designed by Filippi is on its way to the United States, to the Selvig brothers, to be delivered to a waiting college on the East coast. Alex and Fabio will deliver it themselves; they’ll service it–with customary Filippi grace–at regattas. It will be held on a race course this spring, waiting to cleave the American waters and spur its rowers toward the finish line. 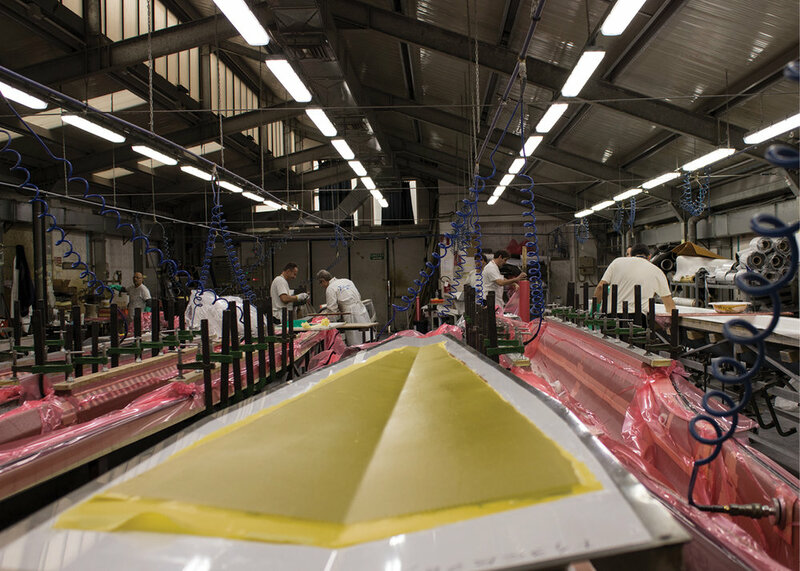 Along its hull will be the tell-tale blue stripe that is the Filippi signature. It’s a literal signature, with a single leg coming off the end of the blue stripe at the stern, forming an L, and two legs coming off the blue stripe at the bow, forming a F.
L. F. for Lido Filippi. Sometimes the family lines can’t be ignored, on either side of the ocean.